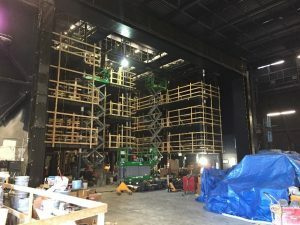 Recently, one of our engineers, Bruce Proper, did a field inspection of a fire curtain at The Yard Theater on Navy Pier. A fire curtain is a safety device designed to prevent a fire from spreading from the stage of a theater to the audience. The fire curtain itself is a large, fire resistant, sheet suspended between the stage and the audience. The fire curtain can be lowered either manually, by pressing a button to the side of the stage, or automatically. The fire curtain is suspended by cable system with the trip mechanism tripped by thermal links, designed to break if they reach a certain temperature, allowing the fire curtain to come down without someone controlling it. The fire curtain uses a hydraulic breaking system so it doesn’t come crashing down when it is activated. Instead, it falls slowly, taking about a minute and thirty seconds to fall into position. This way, there is plenty of time to get out of the way should the fire curtain be activated. While inspecting the fire curtain, Bruce Proper found a violation of safety standards. A particular circuit had live parts and was not properly covered. The theater was on a deadline, and needed the system up and running in at most, two more days. Determined not to let the theater down, Bruce found a discarded metal stud, and fashioned a cover out of the metal. The cover he built provided a suitable electrical enclosure over low voltage parts. This action allowed the fire curtain to be certified as safety compliant that very same day, thus saving the day. Product Safety Consulting Inc. is committed to helping our customers gain safety certification, and we encourage everyone to go above and beyond the safety standard. Regardless of which standards are applicable to your product, let Product Safety Consulting Inc. be “Your Outsourced Compliance Department”. Next Next post: Is your company in need of Safety Certifications?